Paraben, SLS and SLES free. Dermatologically tested. Well tolerated on the skin and on the vaginal epithelium. Nickel, Chrome, Cobalt, Mercury and Palladium tested. With naturally derived surfactants. More than 95 % of natural ingredients. Intimate wellbeing has no age. 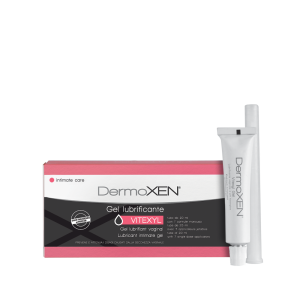 DermoXEN intimate cleanser LENITIVO takes care of women, exerting a moisturizing and soothing action, in case of vaginal dryness, itching and redness, thanks to the presence of a mix of natural extracts. Allergen free fragrance. Lotus flower extracts: rich in proteins and vitamin C, with moisturizing and purifying properties. Baobab and Saw Palmetto: with a soothing action. Aloe Vera juice: protective, refreshing and moisturizing properties. Prebiotic fibres: favour the natural proliferation of Lactobacilli, in order to protect the intimate natural defences. For daily intimate hygiene of women suffering from recurring itching and redness in the intimate area. It is recommended during treatments for gynaecological problems and, in particular, in case of vaginal dryness due to factors such as menopause, use of tampons, stress, hormonal changes and antibiotic treatments.